On November 8, as an exercise in ethical reasoning, students in my Focused Inquiry classes formulated responses to questions submitted to Randy Cohen during his tenure as the writer of The New York Times column “The Ethicist.” Students worked collaboratively in four groups, with each of the four responding to a different question regarding campus ethics. One question addressed the market-style dining system, another dealt with course evaluations, and the other two, unsurprisingly, concerned cheating and plagiarism. The four questions–which appear at the end of this blog entry–prompted considerable discussion, enough to insure that I’ll repeat the exercise again next fall as an introduction to applying ethical frameworks. Students in my Focused Inquiry classes considered those questions of ethics only a day before the announcement of the firing of legendary Nittany Lions coach Joe Paterno and Penn State President Graham Spanier following the arrest of Paterno’s former assistant coach, defensive coordinator Jerry Sandusky, on charges related to the sexual abuse of minors. Sexual abuse—in Sandusky’s case, of eight young boys over a fifteen-year period—doesn’t present us with an ethical question. Its atrocity isn’t an arguable point. But what we would have done if we were Mike McCreary—if we had seen what he saw in the locker-room shower—is another matter altogether. When we return to questions of ethics next semester, it’s likely that students will raise the subject of the Penn State scandal. If they do, it will present an opportunity to consider how acting ethically isn’t synonymous with following the law. Along with demonstrating the difference between ethics and law, and the power of the normalcy bias and motivated blindness, the recent events at Penn State underscore how even our greatest ethical values, such as loyalty, can lead us to act unethically. The ethical questions that follow are the ones that my students addressed in class on November 8. 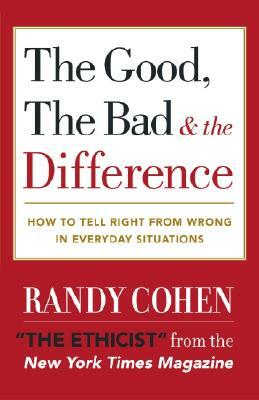 The first three are collected in Randy Cohen’s book The Good, the Bad & the Difference (2002). The fourth question appeared in Cohen’s column on January 20, 2008. Thanks, Randy. I look forward to your forthcoming book. Jane — These questions are fascinating! I bet the conversation was lively and inspired. Thanks, Patty. The conversation was lively and inspired–it’s an activity that I definitely plan to repeat next fall as an introduction to ethical reasoning.